Send your condolences with this lovely card. 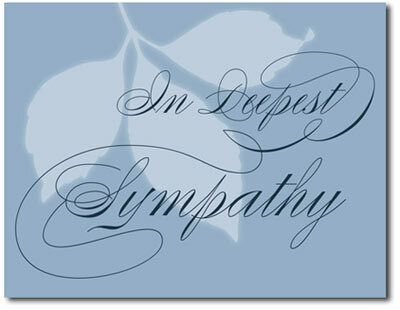 In Deepest Sympathy appears on a blue cover with a leaf subtlety screened in the background. These cards can be personalized with your company or family name. Please Note: This card is smaller than most Holiday cards and measures 5 1/2 X 4 1/4 inches. If you would like your cards completely blank inside (no verse and no personalized message), select verse 000 from the list shown above.